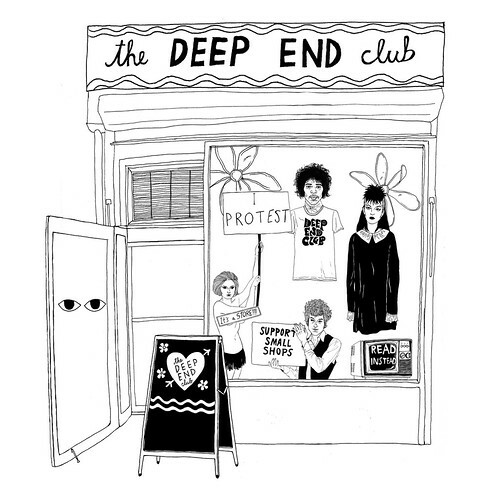 Est in 2013, The Deep End Club is a Community Clubhouse and Online Shop founded by drummer and activist Tennessee Thomas as hub for artists and activists to work together to find creative solutions to the world’s problems. The Deep End Club was born out of the Occupy Wall Street and continues to grow alongside evolving movements committed to meaningful change. The group’s motto GIVE A DAMN! is seen on apparel and tee shirts around the world, and was recently included in a MOMA retrospective, Items: Is Fashion Modern? which explored the present, past—and sometimes the future—of 111 items that have had a strong impact on the world — and continue to hold currency today. You can visit The Deep End Club at its pop-up location in Echo Park in LA from March - June 2018. Not in LA? Visit the online store for all things, Deep End Club.